Throughout the year there are a few times it happens (unless of course you are in grade school) - the long holiday weekend. Some professions allow for more of them than others, but the most common occur during the summer - Memorial Day and Labor Day. For 2010 and 2011, we can include the weekend of July 4th as a long weekend. What makes these weekend so great for weddings? It creates 2 days over the weekend that guests are probably not working during the daytime and won't have to get up for work the next morning - which also means the guests may not have to worry about taking extra time off from work to travel. The Vox Theatre has discounted rates on Sunday compared to our full price Saturday events, so this sometimes makes for busy holiday weekends at the Vox. Busy is good, though! In our first big wedding season, we are happy to say that Memorial Day and Labor Day are already booked on both Saturday and Sunday. Although, we love the idea of having the July 4th weekend being a little more relaxing so we can rest after our 1 year Anniversary party on July 1st, we would be happy to fill that weekend also. For 2011, if your thinking about getting married and of course having your wedding reception at the Vox Theatre, think about Sunday - long holiday weekend. You might save a little money and have a great time. On Sunday, we hosted Paco's Expose Dance Competition . It was a first for both the Vox and Expose. 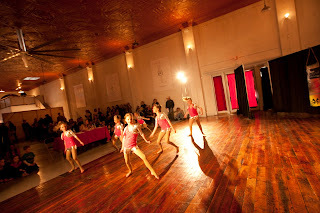 Over 50 dancers and their families visited the Vox on Valentines Day. The dancers ranged in age from 4 to 14. Many performances were solos but we did have a few large groups. One dance featured 18 girls on the dance floor at one time. The dance competition brought in judges Jacoby Mosby and Devan Watring. Both judges are originally from the metro area but have training and experience from around the country. During a break in the competitive routines, both judges showed off some of their skills. Later in the day, Paco and several other professional dancers entertained the crowd. This live mock audition was a unique experience for the dancers to learn and perform a short routine in about 20 minutes. After the performance, the field was narrowed to 5 dancers and then those 5 dancers performed the routine several more time. Contestants judged and trophies were given for 2 runners up, a third, second and first place. 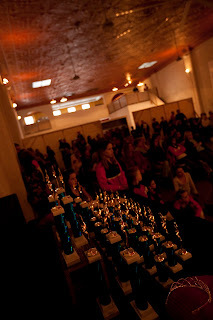 Check out the Vox Theatre on Facebook for more pictures of the dance competition. Kansas City Urban Core Group is having their March meeting at the Vox. We are excited for this opportunity to show off the historic theatre and the work we have done to a group of people dedicated to preserving and enriching Kansas City urban areas. The date is March 24, 2010 from 5:30-7:30pm. A $10 guest fee is payable at the door. Alistair will tell the story of the his purchasing the Vox Theatre and its recent renoviations. 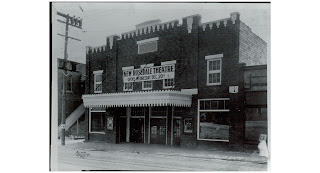 The building was originally built in 1922 as the Rosedale Theater, a silent movie theater. In the 1940's the name was changed to the Vox Theater. It operated as a theater until the early 1960's. At that point it was purchased by KC Heating and Cooling. 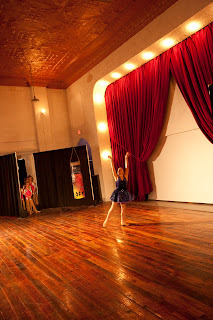 During the ownership of KC Heating and Cooling, a new concrete floor was installed to create a floor that is now level from the sidewalk to the stage. More recently, the building was used to store classic cars. In January of 2009, Alistair Tutton purchased the building for his photography studio with the idea of creating an entertainment hub for the Rosedale and Kansas City Metropolitan area. 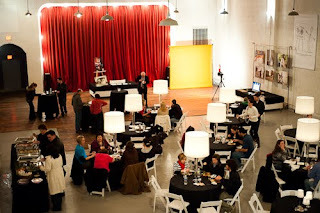 The Vox Theatre now operates as office space, photography studio, and reception/event venue. Welcome to the Vox Theatre Blog! I'm Nichole the event manager at the Vox. 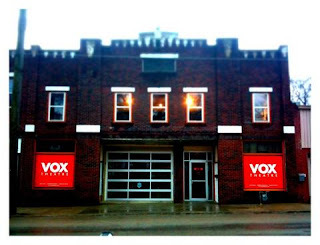 If you haven't made it to the Vox for a tour, I would love to show you around. 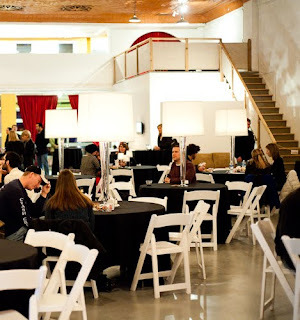 Hopefully, this blog will provide you with information on happenings at the Vox Theatre as well as tips for weddings receptions, charity events and parties. I welcome you to comment on the posts or suggest topics. 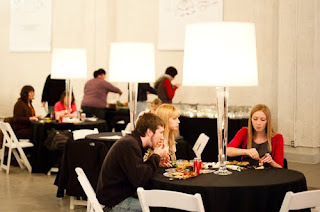 This is a picture of me at the Bridal Tasting held here on January 28. It is more of a "Where's Waldo" than a picture of me, but I am in there. Can't wait for the next time we can work together!